The United Kingdom is one of the best travel destinations and provides tourists with numerous attractions. Comprising majestic mountains, awesome beaches, mountains, splendid forts and palaces, great shopping centers and rich history and culture, the United Kingdom is truly a traveler's delight. The United Kingdom, which comprises four countries - England, Scotland, Wales, and Northern Ireland, provides an unforgettable experience to visitors. London, the capital of the United Kingdom, is frequented by tourists from all over the world. The city is home to majestic monuments such as Buckingham Palace, The Tower of London and Tower Bridge, Big Ben, Westminster Abbey, etc. One of the biggest royal parks, Hyde Park covers an area of 350 acres. The park is home to many statues and sculptures. Also located here is the Speakers' corner where people can hold demonstrations and other protests. Other popular attractions are the London Eye, the largest observation wheel in Europe, Hampton Court Palace, Trafalgar Square, Greenwich, National Gallery etc. A popular tourist attraction, Stonehenge is a prehistoric monument in Wiltshire. The monument is famous for its ring of standing stones. A UNESCO World Heritage Site, the site dates back to approximately 3,000 to 1,500 BC. Edinburgh is a bustling city and the capital of Scotland. Some popular attractions that the city has to offer are the Edinburgh Castle, the Edinburgh Zoo, National Museum of Scotland, The Museum of Childhood, The Scott Monument, The Scottish Parliament, etc. The City of Bath is famous for its Roman built baths. These baths date back to some 2,000 years. The city is also well-known for its Georgian Townhouses. The city is also home to a number of museums and universities. Located in Berkshire county, Windsor Castle is a royal residence. Originally built in the 11th century, Windsor Castle is the world's largest inhabited castle. Some other popular attractions that one can visit in the United Kingdom are the Scottish Highlands, York, Cornwall, Snowdonia, etc. 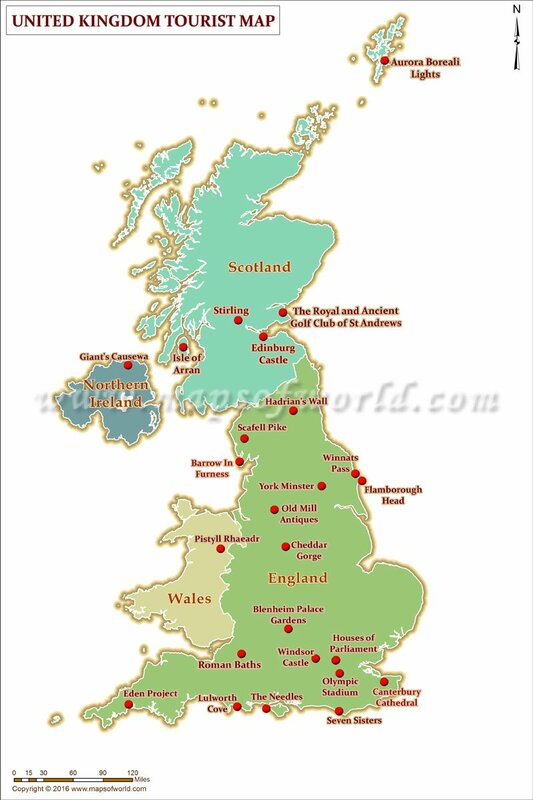 The UK Travel Map depicts the various attractions that tourists can visit in the United Kingdom such as Isle of Arran, Blenheim Palace Gardens, Eden Project, Roman Baths, Houses of Parliament, Cheddar Gorge, etc.